Oh, I wish the shoes I mention are for me. Did you notice the title of this blog is "From Manolos to Muck Boots?" I have a thing for shoes. Boots, sandals, designer or barn sloggers, I don't care, I can't get enough. But this shoe day was not for me. Wah. It was for our boy Siggy (co-loved by Cynthia), who threw a shoe 2 weekends ago and had horrible feet from his ordeals before he was rescued. In time, his hooves will grow to be strong, but for now, they're brittle, cracked, and need expert care. He was very excited for Shoe Day. Well, the top of Willie's head, anyway. Willie loves to talk hoof theory. This is a man's version of shoe shopping, that involves nails, hammers, and in some cases, an anvil and fire! Willie's talking about the physics of a horse's foot and how it syncopates with our bone structure. Actually, I think he was talking about the wild party he went to that weekend and...well, I can't tell you the rest. Farrier/ client discretion, and all that. Siggy, since he has such poor feet at the moment, didn't have a lot of hoof to nail a shoe to (which, by the way, doesn't hurt a horse at all)....so we had to do something different. Enter the Equicast - a wrap much like casts made for humans, but stronger to withstand the beating a horse gives it. Fancy, right? It's still rock solid and Siggy will be in great shape in no time. 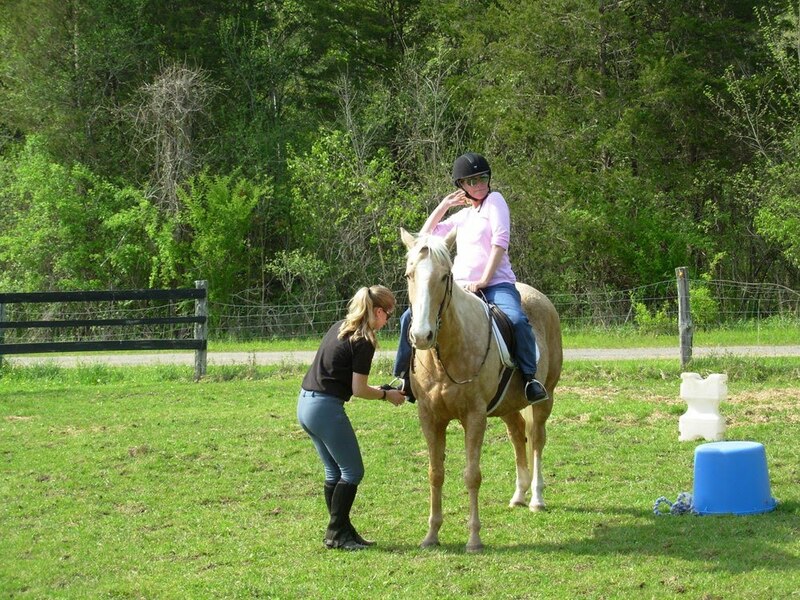 But while a horse is being shod, you have to keep them entertained, like a toddler at the doctor. Otherwise they get into trouble. Siggy is no exception. If you zoom in on that picture, you can actually see that Siggy has decided Matt's fleece pullover is very delectable and good for some mastication. Matt then tries to offer him the leadrope, "Here, eat this, not me." Siggy takes the bait for a moment, but it's fleeting. After this, he decided Willie's water bucket looked really fun! Say it with me now. This doesn't look good. Sorry Willie. I'll bet those clothes dried off in no time! Fresh strawberries, right from my garden! And so many more, on the way! I am so excited that things are growing. I've killed some things, others, have no idea why they're there or how to stop them, and then I have some select items I started from seeds that are just perking along beautifully. First up, we have our broccoli. It's a cold season item, so you can plant them before the last frost. We've had deep freezes since I planted them, and they're still happy. 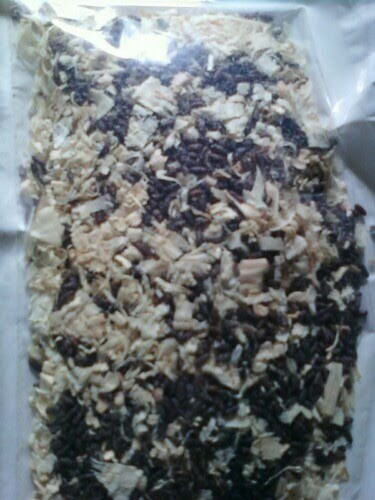 For whatever reason, they are all clumped together in chunks, although I didn't spread the seeds that way. Here's a happy cluster of tomatoes. These are the only tomatoes that are actually flourishing, and I think I should go get a tomato plant instead, because at the rate we're going....we won't have any tomatoes. And if you know me, you know I love tomatoes. Inhale them. All by themselves. I can't resist tomatoes. So I need to go get a plant someone else started, I think. These carrots are slightly psychotic in their growth, and they're chugging along very well. They seem to be happy to be in the ground. I wonder, is it ok that these carrots are kind of in a clump? Will they battle it out over soil space? I have another row of carrots, and they're all spread out and sprouting, but there's like, 8 potential carrots in that pic up there. My peppers are still alive. That's a good start. And there's a little mini guy in there, I don't know what he is, but I guess he's learning from the Big Sprouts or something. An intern, perhaps? These are four green bean plants. I need to plant the rest of the seeds, because these guys aren't waiting for anything. They're flowering, and I think that means they'll be making beans! Right? And of course, our blueberries. Bella the blueberry plant has a few berries (this is her, modeling) and I check every day to see if they're blue yet. Nope. Another day of waiting. Or else I'll have to go and buy blueberries to get my fix. The travesty! These were here from the previous owners - chives! I know they're chives, but the purple flowers were pretty, so I lopped off a bunch of them and put it in the bathroom in a vase, trying to be all Martha Stewart-y, putting my own cut flowers in a vase. The shower guests thought it odd that I had chives in a vase in the bathroom. Someone please take this thing! It's bigger than Topaz! I do believe it's rhubarb, and we have no use for it, and frankly, I think I might just take the leaves and fashion a cabana in the backyard. I wish I had an item to compare it to so you could see how big these leaves are. I'll do that soon. Ah, the garden. I've eaten a total of 4 strawberries from it. And lettuce I was checking to see if it was poisonous or not. It's not. That? Is a thing of beauty! I've been amiss for over a week! How on Earth have you all survived? Just kidding. I bet you're thinking, "Thank goodness that TMF blog hasn't landed in my inbox in a week, I actually got some stuff done!" Anyway, it was a melee of activity at TMF this past week, and I'm happy to say there are calmer seas ahead. Not that we minded it - it was good chaos (for the most part). This past Saturday, we hosted a bridal shower for my future sister-in-law, Kristin. She and my brother Jay are getting married in July - the countdown is on! All pre-wedding soirees are in the works, and this was the first leading up to the Big Day. It was also our first large party at TMF, and a fancy, wine-themed one at that. Sadly, I don't have any photos of the shower in action - I was busy running around opening new wine bottles, greeting guests, prepping and escorting food out and then back in again. The centerpieces were my favorite part, and I didn't have anything to do with them! The shower was a huge success, and we now have more leftover food than we know what to do with. Actually, we'll eat it. Until, like, August. I'm afraid my friends Pete and Anissa are guilty of being Dog Hogs. You know, because you can't have just one dog. That's not possible. If you remember, Pete and Anissa adopted the cute little brown pup that they eventually did name Kona, which suits her perfectly and she seems to love having a cute name. Here's a little bit of info about them: they adopt dogs other people won't. They have two older Pit Bulls, one who was used as a bait dog in a fighting ring, and they have loved these dogs so well, they are absolutely sweet and very well mannered. They adopted the other two as older dogs since they know puppies find homes more quickly. How cute is that little guy? I need to get another photo of his eyes. He has grey eyes like me - very unusual for a dog. And his coat is so soft, I can't believe it. He's very chatty too - always mumbling or singing and generally letting you know he's there. I'm very lucky that I get to seem them a few times a week and check in on them while Anissa and Pete are working. A chance to play with cute puppies? Um, yes please! Names are also up for grabs on this little boy! Suggestions are welcome in the Comment section and will be sent on to Anissa and Pete! It was an absolutely gloomy, dreary, gross day for the middle of May. 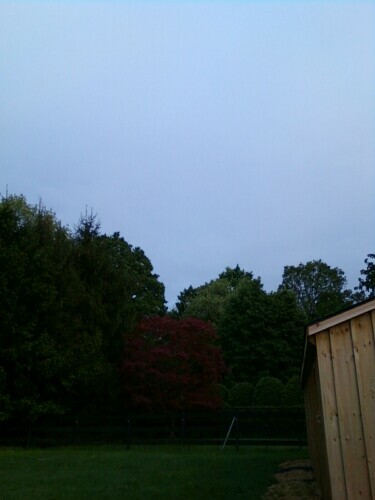 It rained this morning, it misted and showered this afternoon, and it was downright cold. Luckily, this time of the year brings more warmth than cold, and while the day was damp and chilly, it was one more day to enjoy. I try not to complain a lot, and yet, I still find myself doing it sometimes, often without thinking about it. But is my life really so bad? The answer is a loud, resounding no! I feel very lucky to have this life. This is a life given to me by my parents, who instilled in me a strong work ethic and belief in myself; in my hubby Matt for his belief in me, and for his support that I can do what I love and make a decent living at it; and my students and friends, who support our business and give us the encouragement to keep pushing onward. 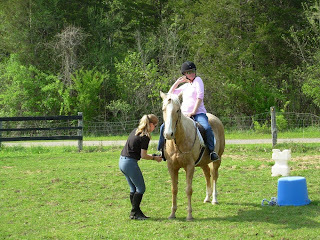 Tomorrow, I have two new students beginning their riding careers at TMF. One is only five. 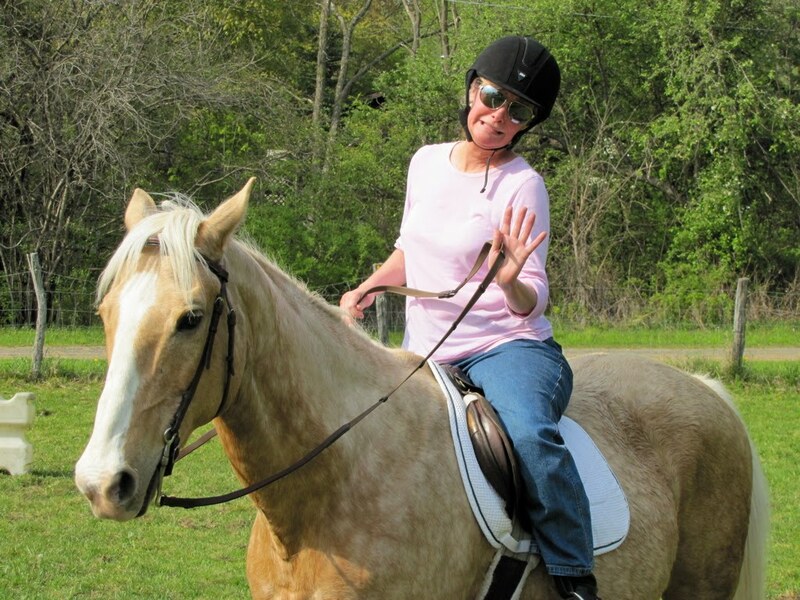 I began riding at 5, and look how that one ride on a pony named Chief changed my life. The other is a teenager who needs a passion - and confidence to carry her through the upcoming four years of high school. 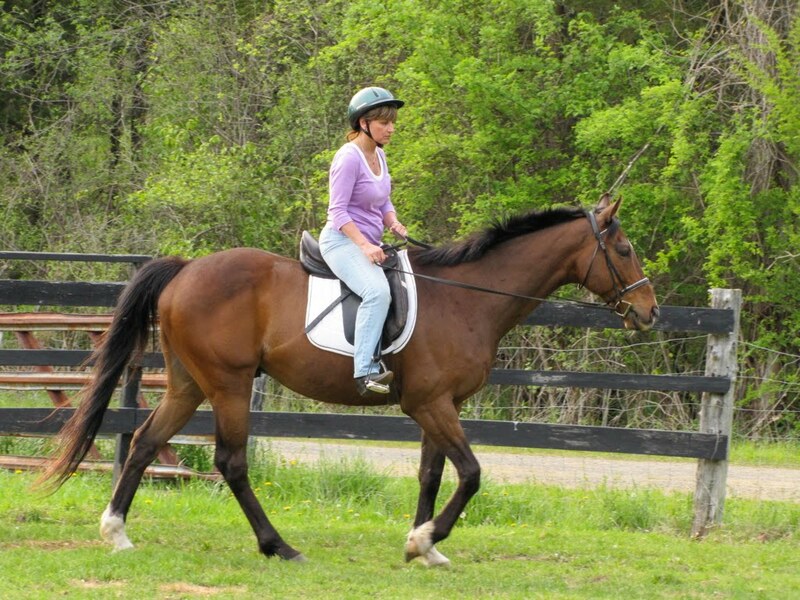 Maybe our horses and I can make the smallest difference in their lives. Instead of thinking about how I could see my breath from the cold, I thought about the days ahead - just how bright they can be. I heard birds chirping, the horses happily eating their grain, and a distant train whistle - the same train that would bring Matt home about 30 minutes later. There are, most definitely, bright days ahead. Yesterday was Mother's Day, and it was a great day to go hang with my own Mom. I brought her a plant, a card, and bought lunch at a cute little restaurant along the way. We also had another Mom in the house, and she wishes I brought her six quarter pounders and a case of french fries. It was Checkers, who was delighted to show off her four little puppies, who are almost 5 weeks old. Look at that. Are you squealing over the cuteness yet? OK, I know you are now. Mom Chex would occasionally check in with the pups, and then go back to searching for the six burgers she thought I should have brought with me. And if you simply cannot take the massive amounts of cuteness, do not, repeat, do not look at the following video! Not to be outdone, Barkley, who happens to be Chex's brother and littermate, decided to show us exactly what he thinks of the Empire Carpet commercials. Barkley has done this for ages, and we just now caught it on video. For whatever reason, he takes great exception to the little animated man in the upper left hand corner of the screen. Every time the commercial airs. Endless amusement, these furry creatures. Happy Monday! Today was an awesome day! Every now and again, you have a ride that just makes you smile, even a day or two after. Zeus and I did his first jump, with me on his back - and Matt put it perfectly - "She's baaaack!" Caution to the wind = wearing helmet and a safety vest. So there was some caution. I'm not stupid. Maybe a little crazy, though. 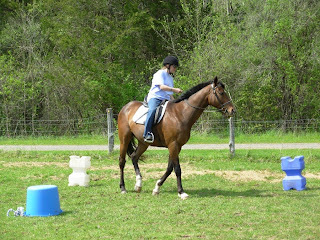 There we are working at a canter. Most ex-racers really haul when they get started in a canter (meaning, they need to be taught to canter slowly), and it's something we've worked on a good deal, and he's almost a tad too slow here, but I'm not complaining - he's relaxed and working very nicely. Then it was time to tackle the fence! Which was, to be honest, about 8 inches off the ground. But still. 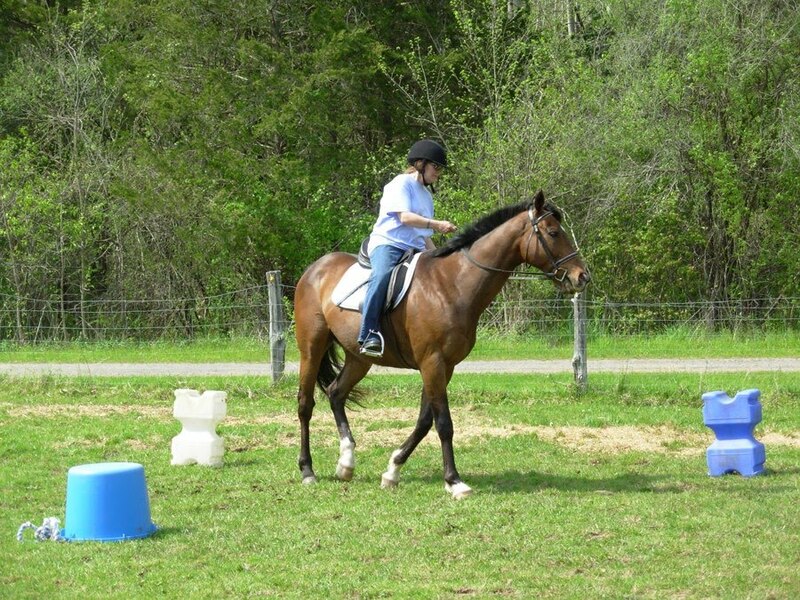 Then we did it at a canter, and he attempted to circle, but that's because we don't typically canter down the straightaway, so he wasn't expecting me to keep him straight. Still, he went right over it, smooth as can be! What a good boy he can be! I can't wait to see what this summer brings. Bugs. They're everywhere. And in most cases, they really annoy you. Flies, mosquitoes, ticks, gnats...gross. I've gotten some literature on something new (to me, anyway) called Fly Predators. These are little bugs that apparently eat fly larvae, thereby bringing down the bug count, which is pretty darn helpful around a horse property. Imagine my delight when I read that they don't bother animals or people, and can be shipped in neat little baggies that you open up and "release" the bugs once they've hatched! Cool! ...and that grossed me out. However, this morning, I can see some moving around in there. And they're teeny! I'd attempt a photo, except I don't think our camera would capture how tiny they are. So perhaps tomorrow, I'll release the little buggers and let them get to work. We'll get a shipment of 5,000 Fly Predators once a month, and evidently our fly population will be nil. Which is very exciting, as Thoroughbreds in particular are thin-skinned and really, really hate insects. I never thought I would be paying to get more bugs on the property. We live in a topsy-turvy world, I tell ya. Fly Predators. The little bugs you love. Ew. But very cool. Ew. You Be the Judge....Why Thanks, I Think I Will! The day after Derby Day was another busy one. On Sunday, I was honored to be asked to help judge the final Stonegate Farm Cross Country Event. Stonegate Farm is owned by the magnificent couple Margaret and Michael Korda. 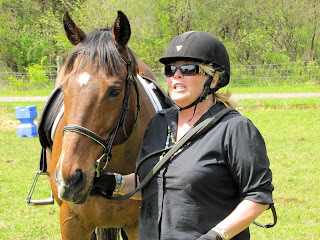 Margaret was an international model and an avid event rider now, and Michael is an incredibly accomplished author and former Editor-in-Chief at Simon & Schuster. 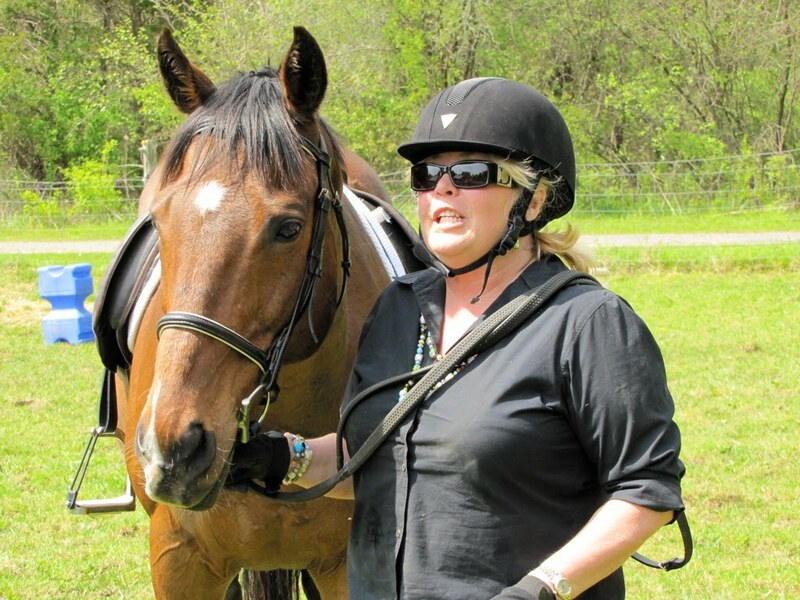 My family and I have known Margaret and Michael for many years, and I had the pleasure of schooling my horses at their course for years. 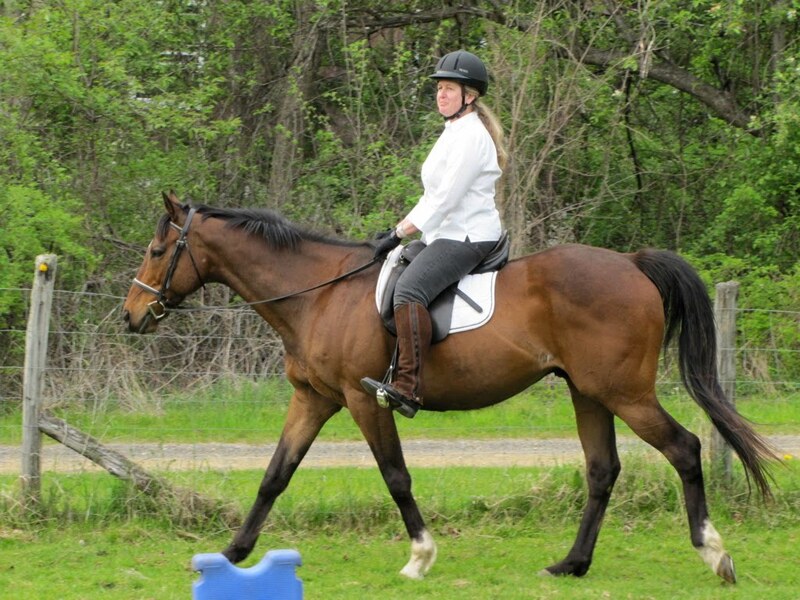 Hopefully, I'll be able to bring Zeus to their impeccable Cross Country course, with acre after acre of trails, fields, and every jump imaginable. I brought Matt along to get a taste of Cross Country - we met after I'd had my riding accident, so I hadn't competed since then. I'm thrilled to say he got bit by the eventing bug, and asked how many years experience he'd need in order to start competing. Music to my ears! 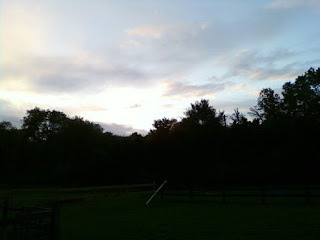 The field we were positioned in is the Field of Dreams, with several lovely but complicated fences to master. Do you believe this is a jump? It's a narrow coop, and although it looks easy, it's quite large and because it's narrow, horses can just skirt by it if they're caught unaware or aren't experienced. Likewise, if the rider is inexperienced, they can mis-time the distance to the fence, throwing the horse off balance and screwing up the whole shebang. This was a lovely rider whose horse handled the jump beautifully. A nice horse, but poor approach. He got too close to the fence, and is hanging a leg as you can see. 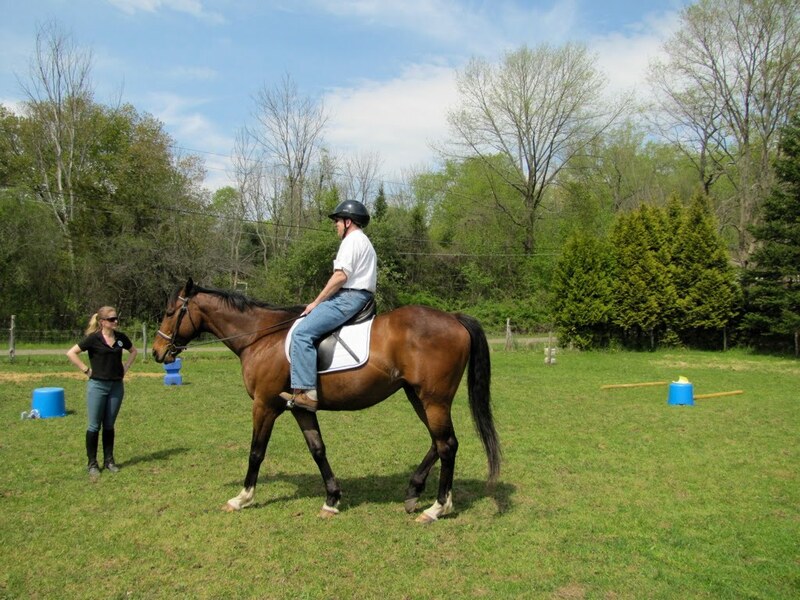 They popped over it, but it was clear the horse was tired and needs to be more fit. 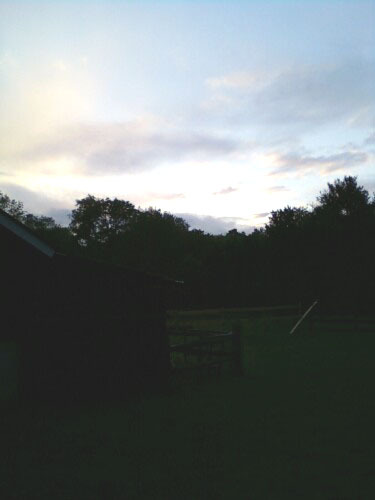 This was another fence at the top of the hill before the narrow coop. An inviting jump, but we heard a few inexperienced riders yelling at their horses who were perhaps losing speed up the slope to it. Matt fondly called the horse in this video the "cow" horse. I corrected him, don't worry. 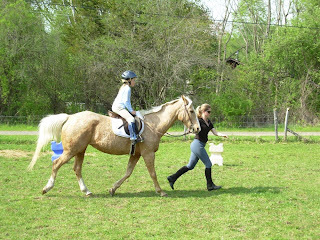 They did a decent job, but as she slowed to a trot to collect herself, she incurred some time faults for slowing down and going over the optimum time. All in all, it was a lovely day and it was such fun to see so many people I knew from my past. Hopefully, with Zeus, they will be in my present and future too! Saturday was a fantastic day! 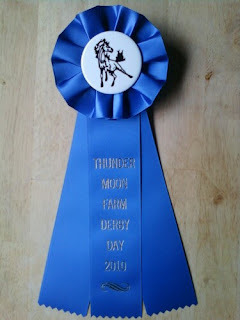 Derby Day was a riproaring success, and I am so glad to have such wonderful students and participants who made the very first event at TMF a memorable day. It was brutally hot, but the horses fared beautifully and got rinsed off with the hose a few times to make sure they were as comfortable as could be, and not overworked. I, however, ended up with a glorious heat rash, but am all good now! The ultimate prize in our races went to the very talented Arliss Paddock, who rode Siggy beautifully and impressed the pants off the rest of the field, who didn't even see it coming. It seems to be genetic, because Madeleine, who happens to be the daughter of Arliss and husband Bruce, came in second. And last but not least, for a photo finish, is Aislinn, who has perfect timing with a camera. I'm not actually fixing Aislinn's stirrup, no....I'm bowing to her insatiable prowess. I've never had such fun on Derby Day. 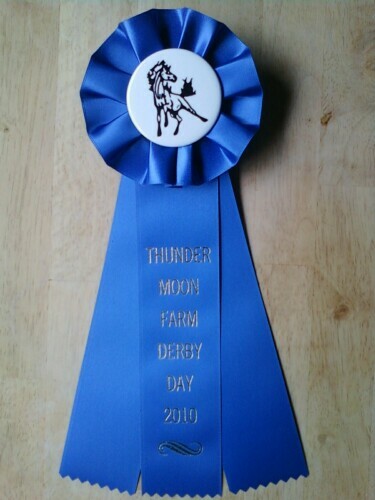 After eating a ton and watching the Derby, everyone went home with happy stomachs and ribbons to show to their families and friends. A good day was indeed, had by all! Tally Ho!